The Kansas City Track Club Ambassadors are a tight-knit community of runners and walkers in the Kansas City area. 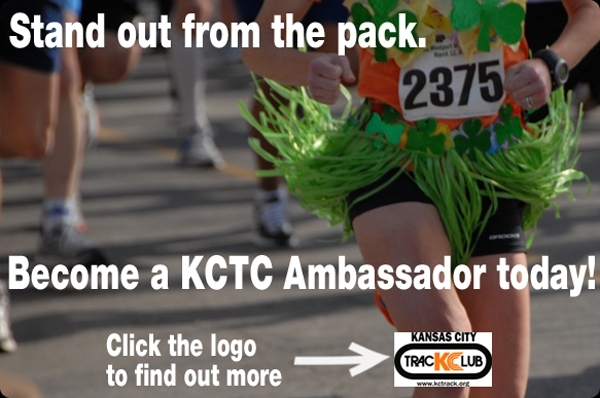 As a KCTC Ambassador you do not have to be the fastest runner, or the most experienced, but you do have to be passionate and dedicated to helping grow the running community in Kansas City. KCTC Ambassadors are role models in their communities, lead group runs, volunteer at local events and help all runners achieve their personal best. How do I become a KCTC Ambassador? Besides being awesome, we are looking for people who are outgoing and can make a difference in the Kansas City running community by promoting the mission of the Kansas City Track Club. Here are a few more things we are looking for. Member in good standing of Kansas City Track Club. Passionate about running and motivating runners of all skills and ability to achieve their best. Passionate about achieveing YOUR personal best. Able to volunteer three (3) times a year for the KCTC community at events or races. Contributing on a monthly basis to the KCTC Blog, telling your ambassador story. Ability to inspire others and lead others to greatness. Free entry to KCTC races. Official ambassador team gear, provided by KCTC. Deals on gear and opportunities to test and review new products. Promotional items to hand out at races or training. Ambassador profile on KCTC website, recognizing you as helping grow the running community. Limited entries in other local races (to be determined). Donation of $100 to a charity of your choice at the end of 12-months of serving as an ambassador. How do I sign up or apply? We are currently accepting applications for the Ambassador program. Our inaugural Ambassador team will be no more than 20 runners (10 male, 10 female) of all ages, sizes, abilities and experience levels. 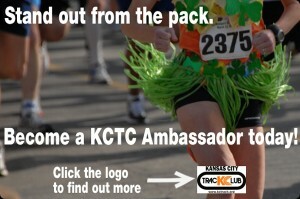 Click here to visit the Kansas City Track Club Ambassador page and fill out the form to apply today!